These Beer Butter Mushrooms are smooth, velvety and full of flavor. It’s a quick and easy side that jives with just about anything in any season. Beer and mushrooms – quite possibly my favorite duo. So. This recipe is almost two years old. The reason I felt the need to revisit it was to a) take better photos and to b) write up a decent post about it. The original was pretty weak and this glorious dish, which is one of my most visited and shared, deserves better. Does it surprise me that a simple side dish like this could increase my traffic? Heck no. For one, there’s beer involved, so that alone gets mad cred. To add to the obvious, this dish is a quick and easy side that jives with pretty much anything all year round. It pairs wonderfully with grilled goodies and it tastes great alongside any roasted entrée. I’m sure you can just imagine the smooth and velvety texture these have after simmering in butter and beer for 30 minutes. And, since mushrooms act like a sponge, you get a mouthful of buttery malty goodness with every single bite while the fresh herbs play off of all that earthiness. Smooth buttery mushrooms soak up the malty flavors of beer in this fantastic side dish. Melt the butter in a skillet over moderate heat. Add the garlic and simmer until fragrant, stirring, approx. 30 seconds. Do not brown the garlic. 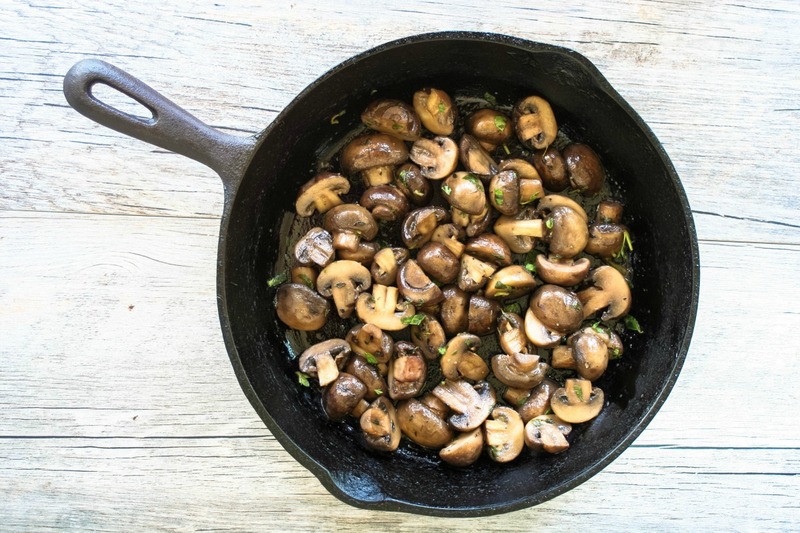 Add the mushrooms to the skillet and toss to evenly coat them in butter. Slowly pour in the beer, and bring to a simmer on medium-low heat. Add the fresh herbs, and kosher salt and cracked black pepper. Poach the mushrooms for approx. 25-30 mins, stirring occasionally. Garnish with fresh oregano and serve. Love mushrooms - this looks like a lovely dish! Smooth, flavourful, and buttery, these beer butter mushrooms I am feeling like to eat them before they hit the plate! Love mushrooms - this looks like a lovely dish! Thanks, Margeret! Definitely one of my favourites. So I have sliced mushrooms sitting in my fridge? Think I could use them for this? Sliced mushrooms can work - though they will likely take less time to cook/absorb the beer so I'd keep an eye on them and lessen the cooking time. What beer did you use for this recipe? Just saw this now, sorry! I used Miller Genuine Draft. haha That is the first time I ever heard anyone else admit to eating mushrooms straight out of the can. I sure did, and my mom could tell you how angry she was once when she went to make a dinner, but alas, the canned mushrooms were nowhere to be found. In my belly. lol Served her right for getting the yummy buttery ones. Anywho, these sound just delicious, and I can't wait to make them!